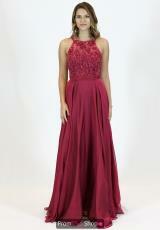 Wow the crowd in this dramatic Sherri Hill prom dress 51694, a dazzling choice for winter formal or prom. Be the center of attention in this astonishing gown that features a high neckline and tulle a line skirt. Beaming stones adorn the bodice beautifully, creating an elaborate floral detailing that is simply breathtaking. Twirl onto the dance floor in this charismatic tulle skirt that flows with elegance and grace.